Are you the type of person who likes to “wow” your friends and family with tidbits chocolate facts of trivia? Here are some fun facts for you to share. After all, who doesn't like chocolate? Chocolate is toxic to dogs, cats, horses, parrots, and small rodents because their bodies are unable to process theobromine which is a chemical naturally occurring in chocolate. Depending on how much they consume and the animal's body size, the consequences of eating this sweet treat could be epileptic seizures, heart attacks, internal bleeding, and death. So, unless you want to make an emergency trip to the veterinarian, consider keeping this human favorite out of the reach of all pets. Did you know that chocolate residue has been found in pottery shards dating from about 1100 B.C.? Forrest Mars, Sr., first saw a chocolate candy covered in a hard shell in Spain in the 1930s which led to his 1940 patented process giving us the delectable favorite, M & Ms. These gems, being produced during WWII when chocolate was rationed, contained Hershey milk chocolate and were originally sold only to the military. 1. Here is an interesting fact about chocolate. The Cadbury chocolate company is located in the United Kingdom, however, candies sold in the USA under the Cadbury name are actually manufactured by the Hershey company. 2. Did you know that the Polka Dot Jersey awarded to the “King of the Mountains” in the Tour de France was introduced in 1975 by then-sponsor Chocolat Poulain. It is thought that the distinctive colors and pattern had something to do with one of the chocolate manufacturer's products available at that time. Chocolat Poulain was one of the oldest brands of chocolate in France prior to being bought out by Cadbury-Schweppes in 1988. The founder of this company was Victor-Auguste Poulain, a visionary who industrialized chocolate production as he believed that the wave of the future was to market this confection to the masses rather than the elite. He specifically targeted families and children in his marketing campaigns. Chocolat Poulain was known for producing chocolate bars for both eating and baking as well as Poulain Orange, a chocolate drink mix. Chocolat Poulain began mass production in 1848, incorporated (ltd. in Europe) in 1893. So, as you enjoy the Tour de France each July and cheer on the mountain climbing riders vying for the Polka Dot Jersey, remember Victor-Auguste Poulain with thanks for bringing chocolate to the common folk. 3. What has Danny Elfman to do with Chocolate? That's easy. He composed the score for the 2005 Tim Burton remake of “Charlie and the Chocolate Factory”. An award-winning composer, Elfman is also a former rocker... Remember the band Oingo Boingo? He was one of the vocalists for the band and is a very gifted singer as well as a musician. Thanks to Filmtracks for the scoop on the Elfman/Chocolate connection. A race car that runs on CHOCOLATE?!? Are you kidding me? - A British team of engineers from Warwick University have come up with an ingenious fuel made from chocolate…actually, they’ve used the waste left over from the production of chocolate. Thankfully, they won’t be removing our favorite treat from the supermarket shelves to run their Formula 3 racing car. 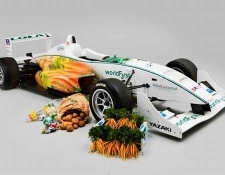 And get this…the steering wheel is made from carrot fibers and the seat from soybean oil. In fact, the majority of this car is made from recycled or repurposed product; many of them natural. Look out, landfill, you may become the source of a whole new generation of automotive supply and fuel in the not-too-distant future!